Democrat leader Nancy Pelosi is hanging out at a posh Hawaiian resort and spa this week during the government shutdown. She ditched DC without a counter offer to President Trump. Officer Ronil Singh’s grieving brother, Reggie, thanks police for their work. Officer Singh, a legal immigrant, was gunned down by a dangerous illegal immigrant and gang banger. This will absolutely break your heart! 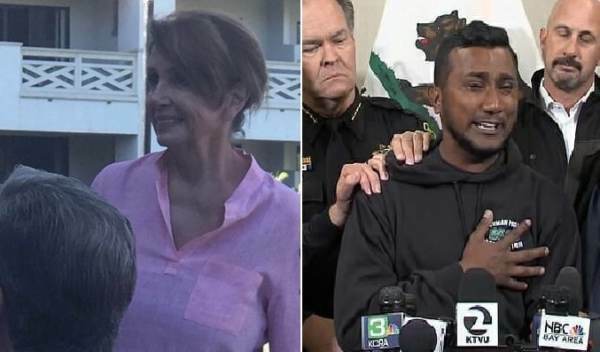 Illegal alien Gustavo Perez Arriaga was arrested near Bakersfield, California on Friday about 280 miles southeast of Newman, California. He gunned down legal immigrant officer Cpl. Ronil Singh on Christmas. Again… What’s wrong with this picture?